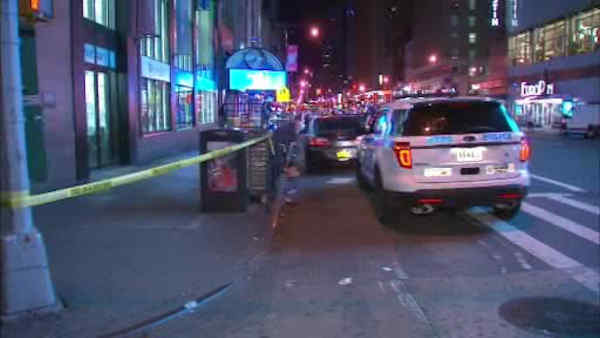 MIDTOWN, Manhattan (WABC) -- One man was slashed in the neck during a fight in Midtown. The dispute appeared to start inside the Duane Reade on 42nd Street and Eighth Avenue just before 3 a.m. Wednesday. The scuffle spilled outside, where one man was slashed in the neck. He was taken to the hospital with a non-life threatening injury. Two men fled the scene north on Eighth Avenue. No arrests were immediately made. One suspect is described as a black male, 5 feet 7 wearing a black jacket. The other was a black male wearing white jeans and a black tank top.